Gems are special items in the game that impart special attributes to your Equipment - which in effect will boost it in some sort of way. There are different types of gems that are distinguished by their color. Aside from this, they also have levels and can be fused in quantities of 3 to obtain its higher level. 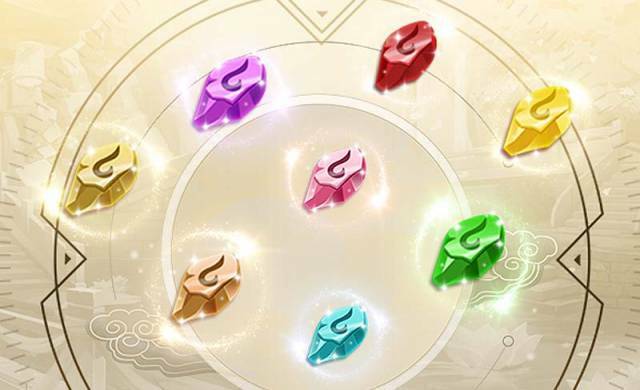 All equipment in the game has only three spots for the gems, which are accessed only upon reaching equipment rating of 18, 40, and 55. Also, you should know that a particular type of gem can only be imbued to the same equipment once. 1. Log-in Bonuses - a level 3 gem pack is awarded on the 5th day of the weekly log-in, and a level 1 gem pack is rewarded for being online every 45 minutes. 2. Mall - gems can be purchased from the Mall using Ingot. 3. Faction Shop - you can alternatively use faction contribution to purchase gems (best chance with top factions in the server). 4. Errand - when your rank reaches Lower 4, you'll get access to the "Errand" section of the game. After completing the Tasks there, gems will be rewarded. 5. Tasks - take part and accomplish in-game tasks, and most of the ones you are required to accomplish will not only share progress to your Character and roster of Heroes but also reward you with useful items like gems. 6. Achievements - similar to Tasks, gems are in some Instances rewarded on milestones you reach in the game. For Tanks or Melee Heroes, you'd typically want to imbue HP, defense, evasion, or resilience gems in their Equipment. Not limited to this though, you should consider checking a Hero's special skills to try and figure which gem would plausibly best be paired with it. Tanks are meant to take hits for your whole party and sustain a longer fight by ensuring he/she stays alive to act as a barrier between enemies and your party (especially those on the back row) -- so focus on how to improve on that. For damage dealers, and Support Heroes, you'd typically want to imbue attack, accuracy, critical, and agility stones. Again, you should consider checking their special skills and figure out which ones are best paired for them. The back row are generally the damage dealers and support, so Defense would be the least choice for them. Try to focus on improving on their attacks instead - especially on your AOE heroes. Gourmets on the other hand are the healers in this game. It sure is the basic rule of thumb to get someone beefed up to take on attacks, but to sustain a longer fight, you should also help the Tank by enlisting a Healer in the roster. This is exactly why you need at least one Gourmet in the team. Different healers have different special skills in the game. For instance, if the healer you have has a healing skill that is dependent on his/her HP, then you must consider putting HP gems on her Equipment.